I WOULD love to be able to go to a concert in Mill Valley, California on Monday 24 October. It's a benefit for John Perry Barlow - sometime songwriter for the Grateful Dead, cattle rancher and (unsuccessful) Republican candidate. Barlow suffered a heart attack on 27 May 2015, while in hospital after surgery following a staphylococcus infection. He later Tweeted "I was dead for about 8 mins...". He has been in hospital most of the time since. And now he's in trouble. 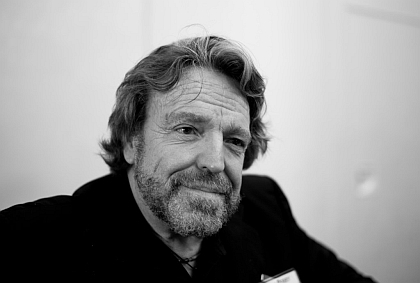 His family formed the John Perry Barlow Wellness Trust, which launched itself thus: "Tragically, even a healthy savings and robust insurance is no match for the cost of extended convalescence in contemporary America. Thus, after 18 months of onerous outlay without any income and recently expired disability benefits, we have reached a critical juncture where we must reach out to you, his fellow innovators, artists, cowboys, and partners-in-crime, to help us provide the quality of care necessary for Barlow's recovery." This is, of course, a damn good reason to campaign to maintain a National Health Service, free to all at the point of use, in the UK. It is also, if I may say so, deeply and tragically ironic. Barlow has also been possibly the foremost advocate of the idea that all creators should give up on the idea of being paid by people and companies that make copies of our work, and rely on fees for performing it. Back when the internet was a fresh thing I talked long with him about the need for new ways of rewarding creators. I discovered the continental European tradition of authors' rights as rights of the individual creator. He came out with the enormously influential essay "The Economy of Ideas - Selling Wine Without Bottles on the Global Net". This concludes: "The economy of the future will be based on relationship rather than possession. It will be continuous rather than sequential... most human exchange will be virtual rather than physical, consisting not of stuff but the stuff of which dreams are made. Our future business will be conducted in a world made more of verbs than nouns." One of the people who enthusiastically took up this cry was Jaron Lanier, dreadlocked creator of the term "virtual reality" and also a musician and collector of rare instruments. Then, in 2013, he wrote Who Owns the Future - arguing that everyone must be paid every time value is extracted from their creative work, down to each Tweet and Instagram post. Asked to look into this for New Scientist , I naturally wondered - what had made Lanier change his mind? I found a talk he gave at London's Conway Hall. In it he recounted noticing how often he was playing benefit concerts for musicians who had given up on income from publication, spent the money from performances, and now couldn't afford healthcare. Income from copying of our work has, since the first stirrings of argument for droit d'auteur in France, been seen as a kind of pension plan for authors. Even if feckless, even if Romantically dedicated to our work above material concerns - we deserved a continuing income and, indeed, our families an inheritance. Not everyone has the option that Barlow is now left with. I wish him all the best in his travails.